Click the button below to add the Ritchie Yellow Jacket 60407 - Tubing Expander/Swager to your wish list. With long handles for comfortable leverage, easily expand 5/16" to 1-5/8" O.D. soft copper and aluminum tubing in seconds. Select from six expander heads to attach to the front of the handles. * Optional sizes sold separately. 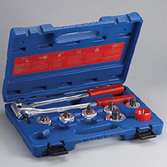 * 60493 Hydraulic Tube Expander Kit expander heads are interchangeable with the 60407 Tubing Expander/Swager. To upgrade your 60407 to the hydraulic version, order the 60494 Hydraulic Expander Pump with reamer in case. Use on 0.047" wall soft steel to 1-1/8" O.D. Use on 0.039" wall stainless steel to 7/8" O.D.